Short version: Powerful and easy to use, this is probably the best cross-platform photography management software out there — though navigation and organization aren’t the most intuitive. Version 3 adds some useful features, but whether they are useful enough for you to upgrade is for you to decide. I just want to state up front that this is a basic review of this software, not an in-depth one. For a long, extremely detailed write-up, see DP Review’s. 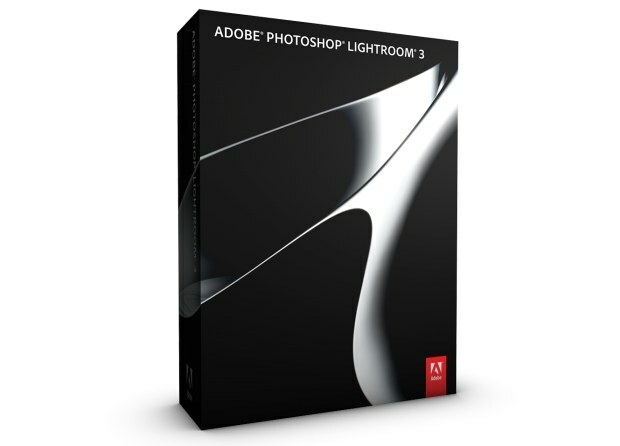 I will be focusing on how this software has (and has not) been useful to me personally as a photographer. Furthermore, Lightroom has been around for quite a while in more or less its present form, so I won’t labor over features which have existed for years. 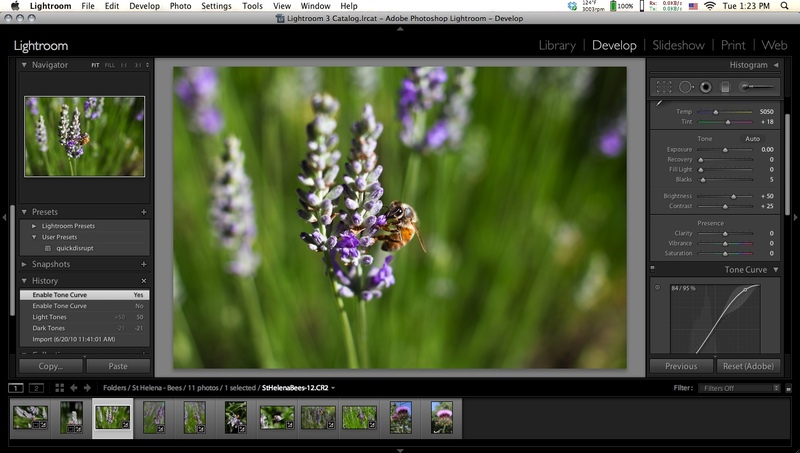 Lightroom has been updated to 3.2 since its release, which has fixed several bugs and added many new lens profiles. The main idea with Lightroom, as opposed to competing software like iPhoto, Aperture, and more general-purpose viewers like ACDSee, is that you establish powerful, partially preset workflows, making the process of taking a picture from camera to whatever end format as easy as possible. This is evident from the modular, step-based left-to-right UI setup: browse and import in Library, make adjustments in Develop, and then export or share in one of the ways provided. Obviously you can see the patterning in the fringing there and in out-of-focus bits, though depending on your output, it may be better that way. Of course, I could just brush on the sharpness using the incredibly versatile brush tool. Judicious use of the brush can really make your pictures striking, and makes you feel like you’re really pulling some darkroom tricks, but brushes have been around for quite a while, so let’s not linger here. The brushes are better than Aperture’s. 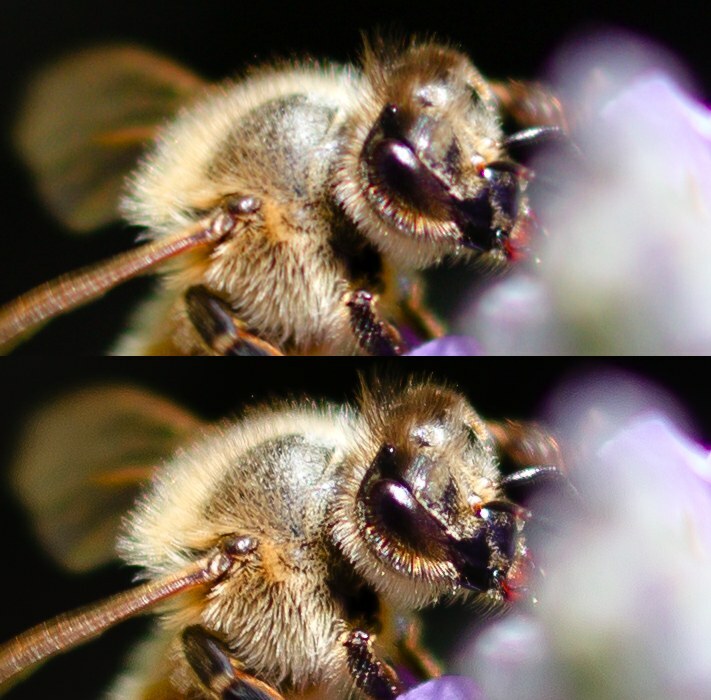 A new tool for making the best of your pictures is the lens correction library. I feel it’s something Adobe put a lot of work into, but which users will only see a little bit of. I’ve been unable to use it, since neither my 24-85 zoom nor my 35mm f/2 are included in their profile library, though to be fair neither is still manufactured. The tool itself is easy to use and adjustable, so if you just want to reduce the natural vignetting a touch (or enhance it), you’re free to do so. The perspective correction tool is more useful. I personally am a bit obsessive about orientations in pictures, and being able to adjust the perspective after the fact to make a window or building front absolutely square is excellent. The preset system is powerful and very easy to use. When you take a dozen or a hundred pictures in the same environment, it pays to be able to apply a quick temperature, contrast, and exposure adjustment. For example, I was shooting at the TechCrunch Disrupt conference and, after adjusting one photo for the light and exposure settings I would be using a lot, I just saved those adjustments as a new preset and one click applied it to any other shot. Very simple, very easy, very customizable. Once you get in the habit of creating and applying these presets, you tend to find yourself a lot more “keeper” shots, I’ve found, which can be a good or a bad thing. 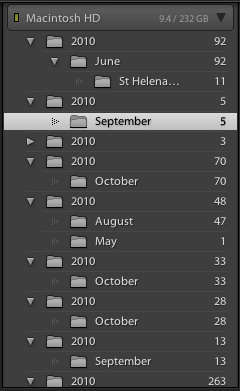 The organization style of Lightroom just doesn’t work for me. I think with a little more time I could get used to it, but it tends to multiply nested folders and make things more complicated than they need to be. Aperture’s method of drill-downs seems much more natural to me. You can, however, tag and search for metadata, which makes things easier — but I just found the Lightroom organizational principle a pain. I’m really not sure how I got it to look like it does at right, but that kind of thing should be impossible. Navigation seemed a little overcomplicated, as well. Keyboard shortcuts could be better chosen, and I feel that it’s easy to get lost between the different screens, or accidentally navigate away from what you’re trying to do. This is more a matter of taste, though, and when you’re “in the zone” and serially adjusting a roll of shots, it feels great. Establishing a workflow within Lightroom (having import presets, knowing the limits of the tools, having a few keyword conventions) is very important, but it could be easier. The output options increase with plug-ins; I won’t enumerate the many options you’ll have, but a quick search for Lightroom plug-ins will show you the many ways you can modify your Lightroom experience. I stayed vanilla for the purposes of this review, but I know that the plug-in library has grown to encompass quite a few extra services. I wouldn’t bother organizing my video in Lightroom; sure, you can add it into your existing organization and store videos with your photos, but really, you want access to those with your video editing program, and having them accessible in a “footage” folder or what have you is just as good. While some of Lightroom’s organizational principles are difficult to get used to, they can be gotten used to, and in the end it’s the photos that matter. Their processing engine, presets, and the versatility of the tools they provide within the program, all make for an excellent photography tool, if not the best collection tool. I’ve found it an agreeable alternative to single-photo editors like Photoshop, and I’m glad to see it focus on photo-in, photo-out instead of going all-out metadata like Aperture. For taking a roll of pictures and making them look as good as possible, and then getting them into the form you need to have them, Lightroom is probably the best enthusiast solution out there.